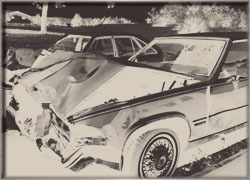 Thirty-two percent of people who suffered a fatal TBI spoke after the incident at issue. Seemingly their injuries were not severe. Brain injury is a process. He knew where it was. But not being confused in the five minutes after a crash does not mean that there could not have been a brain injury. And simply being lucid, doesn’t even exclude the type of brain injury that might involved a fatal injury. 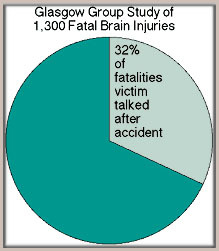 See the below graphic, which indicates that 32% of those with fatal injuries, had talked after the initial injury. Because brain injury is a process the damage may be ongoing from the time of the accident to several hours after the injury occurred. The victim of an accident may even go into a coma several hours later. This is the reason some brain injury survivors may go undiagnosed or misdiagnosed. You can read about some instances of a delayed coma in our TBIvoices pages. https://tbilaw.com/tbivoices. These are stories of actual traumatic brain injury survivors. Source: Graham, Gennarelli, Greenfield’s Neuropathology, ©1996 Oxford University Press, page 197.